*'''[[Carl Johnson|Carl "CJ" Johnson]]''' - The [[protagonist]] of the game. *'''[[Carl Johnson]]''' - The [[protagonist]] of the game. *'''[[Characters in GTA San Andreas|Characters]]''' — The people who make the gameworld immersive. 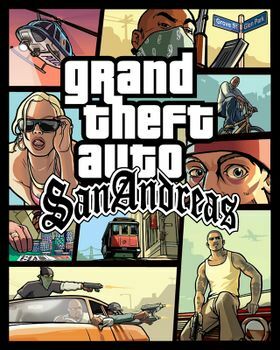 *'''[[Cheats in GTA San Andreas|Cheats]]''' — Cheat codes are available for the PS2, Xbox, and PC versions. *'''[[Collectibles#Grand Theft Auto: San Andreas|Collectibles]]''' — Information about the types of items that can be collected. *'''[[Modifications|Mods]]''' — Third-party mods add different elements to the game. *'''[[Myths/Legends in GTA San Andreas|Myths/Legends]]''' — Detailed information on all the rumors, myths, legends, and glitches in the game. *'''[[Characters in GTA San Andreas|People]]''' — The people who make the gameworld immersive. In the topright frame on the cover of the game, a street sign saying Grove Street / Glen Park is shown, implying the two streets intersect. In the actual game, the two streets are in different parts of the city.